Patrick Heron’s writing on art put the St.Ives artists into public view. 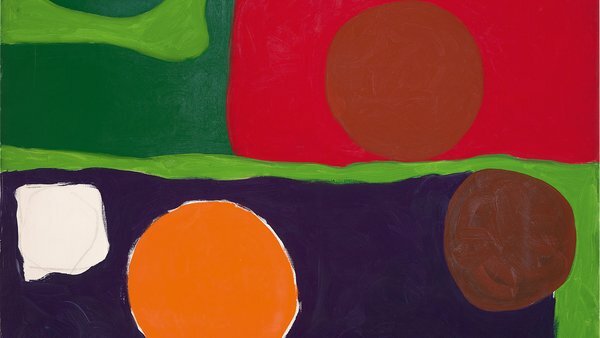 It’s a very enjoyable show with captions featuring remarks Patrick Heron wrote about painting, about the need to achieve balance, about the way the edges of a painting are so important as the onlooker’s eyes look from them to different points in the composition and back and to and fro. Some influences from Braque, Rothko, Robert Indiana,.can be seen and Patrick Heron mentions looking at Bonnard. The early paintings are more figurative with a middle period of more solid coloured shapes that could have been cut from paper like Matisse, and then later looser ones with more space and calmer, lighter colour. I think these are the ones PH began thinking of them as entirely abstract but later realised how influenced he was by flowers in his garden. The influence of the Patrick Heron sort of art is alive, very much so in St.Ives. Painters like Felicity Marr carry it on, most of the Penwithy art in the Penwith Gallery down the road upholds its aims, but there’s so much more now, humour, politics, gender identity, ecology. After the Second World War’s carnage I think artists welcomed a refuge in a simpler world of art, art like music, form and colour, a rest from horror. I think our times cannot just keep that going; it’s a new time. However, it’s balm for the troubled soul to spend time in this show.